I noticed no one had started one this year! And after loving the struggles and success of @Jupjamie last year, I felt obliged to gift the forum some entertainingly bad management skills from myself as we try to do the same again and bring glory to all of San Marino using players who have came through the academy only. 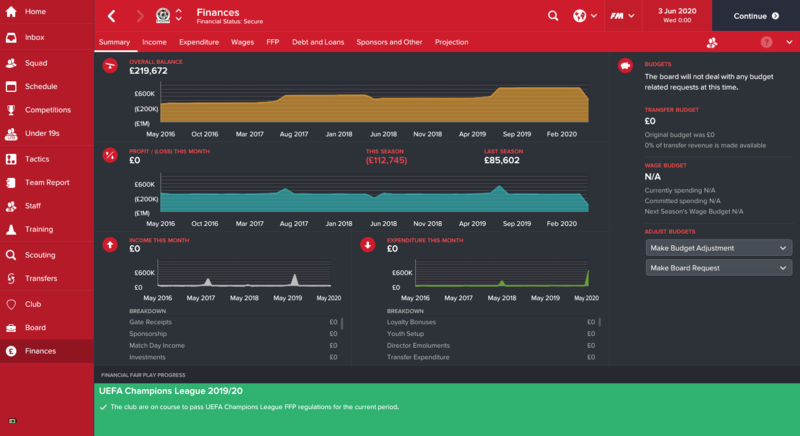 I'll be playing this in the same sort of style that Jupjamie did - if we ever become consistent enough to be winning the league then the majority of my seasons will probably be holidayed. That's quite a big if though. 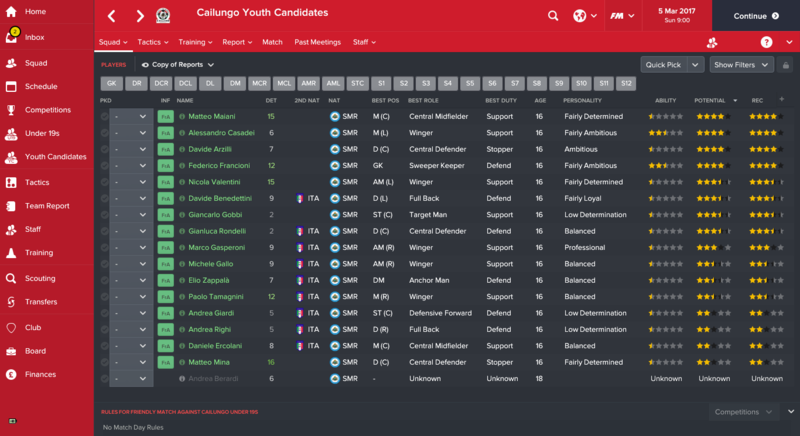 Updates will come in the form of European exploits, then the youth intake and then an end of season update. 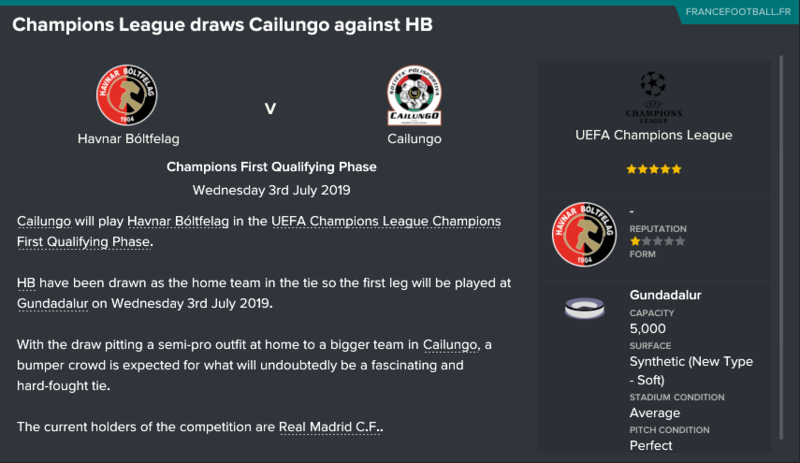 Finally, if you're wondering where the San Marino league came from, then I suggest having a look at claassen's World League Pack which is an incredible collection of leagues from around the globe and contains some truely fantastic work. Here's a look at the club's facilities. Playing at a 500 seater stadium - which, if I'm not mistaken, is everyone in San Marino's stadium - with a synthetic surface which is mildly interesting. Furthermore, the terrible facilities and there for all to see although to be fair, basic youth facilities is better than I originally expected! 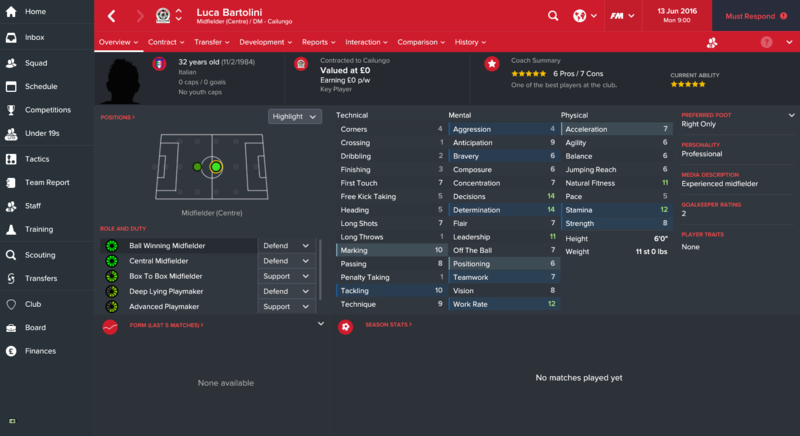 Bartolini is easily our best player and it's clear to see why - ratings of 10 for passing and tackling are near unheard of in this league. Perhaps even more crucially, his professional personality and 14 for determination make him an outstanding tutor and I'll be trying to keep him around for as long as possible in order to provide our young guns with some guidance. Finally, I'll end this post with my manager profile. A young Finnish chap. I picked Finland at random just because I fancied it - it will be interesting to see if we get any Finnish youths appearing in our intakes. One to watch for sure. Not got a lot to live up to! Good luck in San Marino! 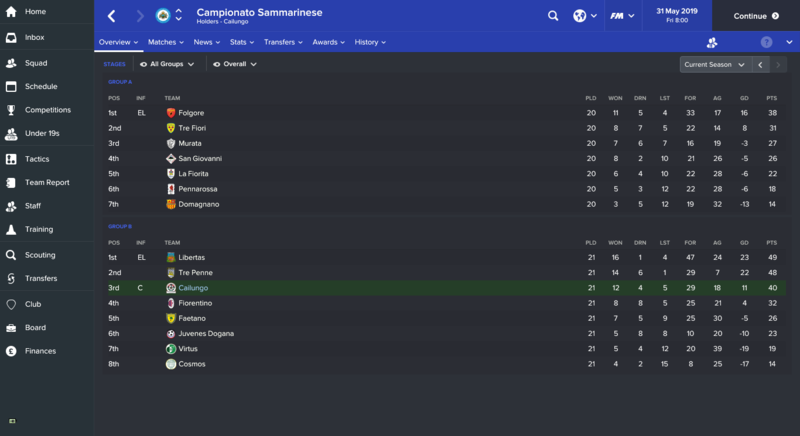 Let's make San Marino dominate for the first time. Thanks man - if I have even half the success you had last year, I'll be delighted. The first of hopefully many increases over the coming seasons. We now have basic junior coaching! It's a good looking intake. 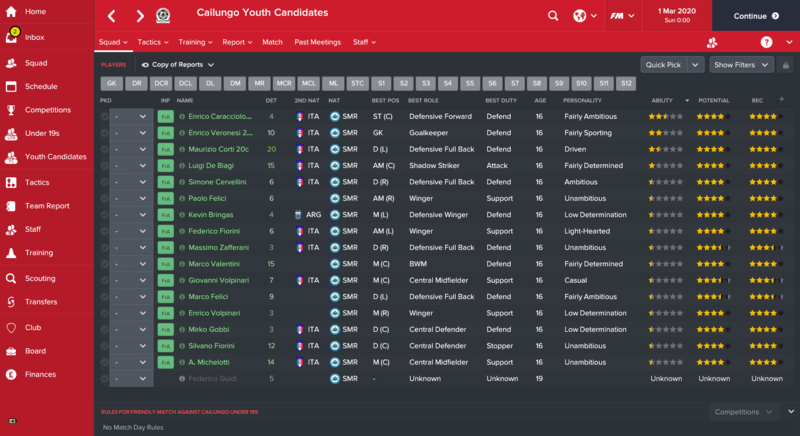 I'll sign all of them to bolster our U19's which currently has no one in it. I've tagged the top six players who I like the look of who you can see below. 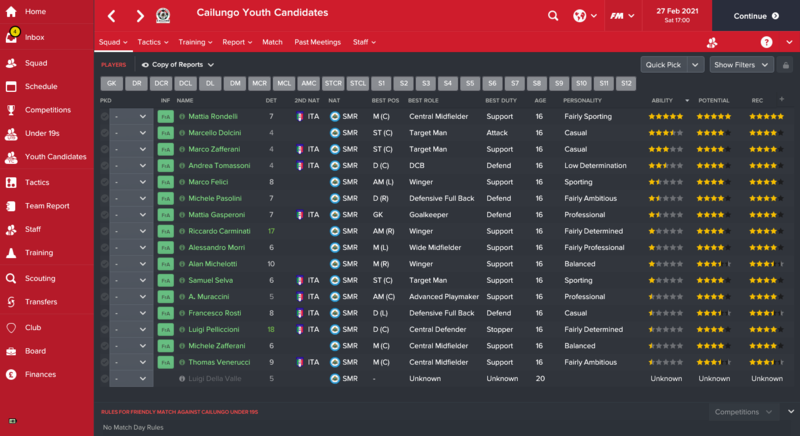 It;s pleasing to see the top prospects don't have Italian second nationality. Just as pleasing, and somewhat curious, is the high determination of some of these players. I've no idea where that came from! Potential starter right now and hopefully can only get better. Another potential starter although I imagine I'll give him at least a year before trying to bring him into the first team. We shall see. Nice determination, hopefully that will stick around. Might get him tutored by Bartolini - will reduce is determination by 1 but should give him a professional personality. 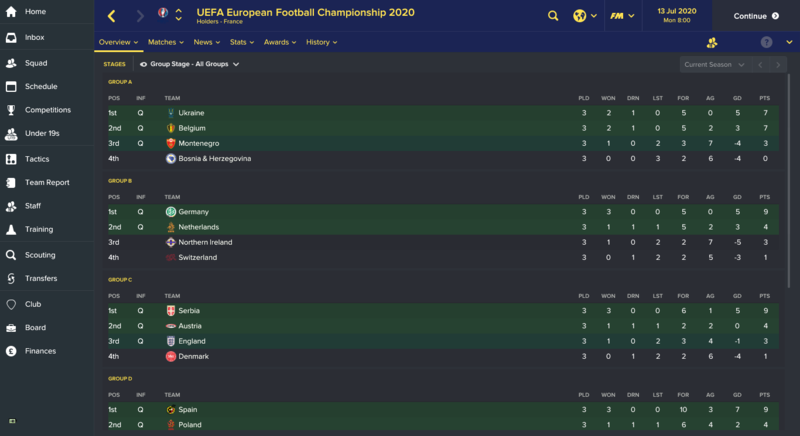 As you can see, it was an incredibly successful season for a team predicted to finish dead last as we finish runners up overall and qualify for the Europa League in the process. It was a stressful season at times, particularly towards the tail end where penalties would prove to be our downfall in the cup and the league, although we'd have a second chance with the league thanks to the crazy system. 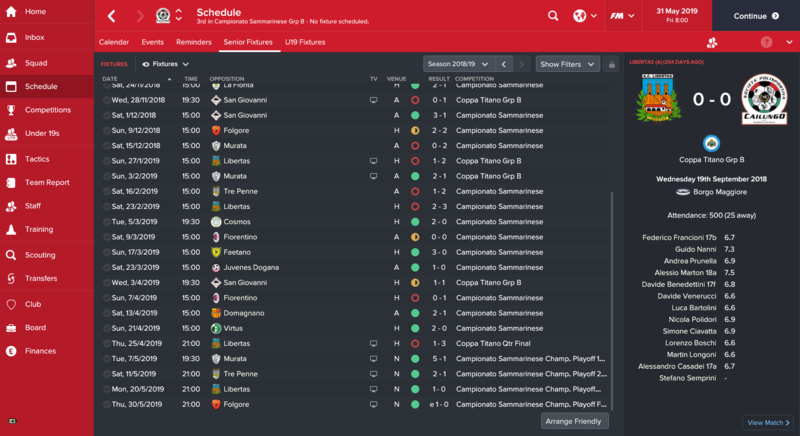 We took that second chance well and ended up making it to the final where we lost out to a better team in Tre Penne. 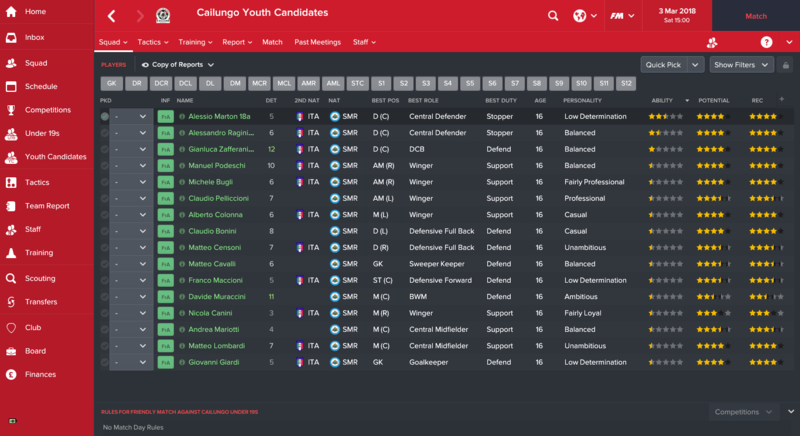 A team who you'll note from the screenshot finished third. Never change, San Marino. We also topped our Coppa Titano group, but the afore mentioned penalties weakness saw us drop out at the first hurdle of the knockout stages after a 3-3 draw with Libertas. You have to feel a bit for Libertas who ran away with our league and finished 14 points clear of us. They don't even have a runners up medal to show for it. I should be slightly concerned that our top scorer is 40 years old but he was our first choice the whole season so really he's done what was expected of him. We did pick up a tall striker in the youth intake but whilst he has good finishing and heading, he would be beaten by Per Mertesacker in a straight sprint so I'm not sure if he's a viable option. We have an Argentinian forward, Martin Longoni, in the wings but he wasn't entirely impressive coming off the bench. Could end up being problematic. Tre Penne lost in the first qualifying round of the Champions league to Maltese champions Valleta. 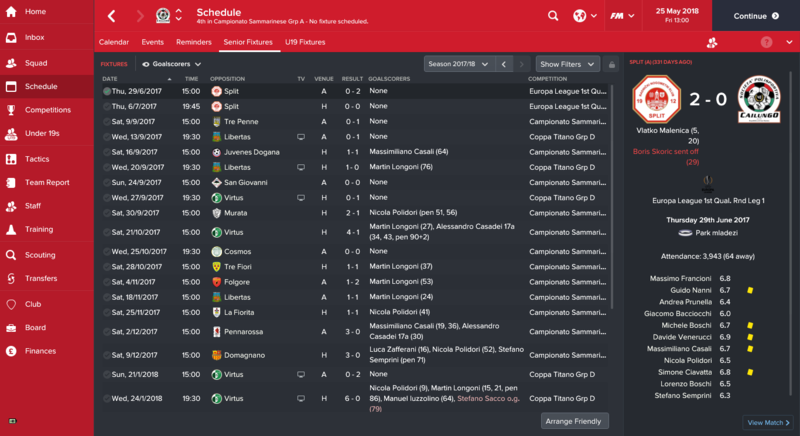 They put up a brave fight away from home and picked up a 1-1 draw but lost 2-1 at home to send them out on aggregate. La Fiorita lost 12-1 on aggregate to Lokomotiv Zagreb in the Europa League first round qualifier and the less said about that the better. Foglore showed a bit more of a fighting spirit in only losing 6-0 to Domzale of Slovenia. I think it's still maybe too early to be thinking about taking home the league title even though we went so close this year. Therefore, targets this year are not to be embarassment and Europe and secure European qualification by the end of the season. Should be achievable. 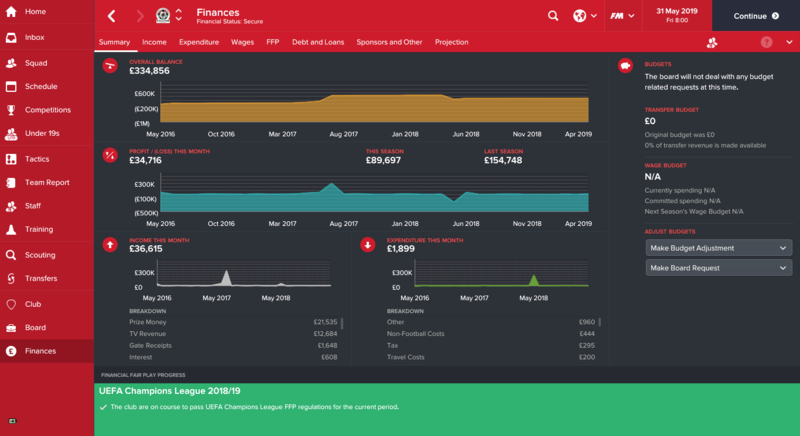 I have a few leagues set to view-only to peak my interest in the world and a certain news story prompted me to create this little round up. In England, the Premier League returns to Old Trafford for the first time in a few years as the Special One wins the league at a canter, 9 points clear of surprise runners up Tottenham. Arsenal and Man City finish 3rd and 4th, with Liverpool coming 5th and, rather surprisingly, Conte's Chelsea finishing a disappointing sixth! José also brings home the FA Cup for the second year running while the League Cup heads to the Emirates. As one might've expected, PSG romped to victory in France finishing 14 points clear of 2nd place Monaco who themselves finished 19 points clear of third place Saint-Étienne. I don't even know how you would describe that; a one horse race of first and a one horse race for second? Germany sees another one horse race as Bayern storm to the Bundesliga title by a massive 21 point margin over runners up Dortmund. Leverkusen and Schalke round out the top four there. Things were much closer in Italy but still not very close as Juventus wins Serie A again by eight points ahead of Milan in second and Inter in third. 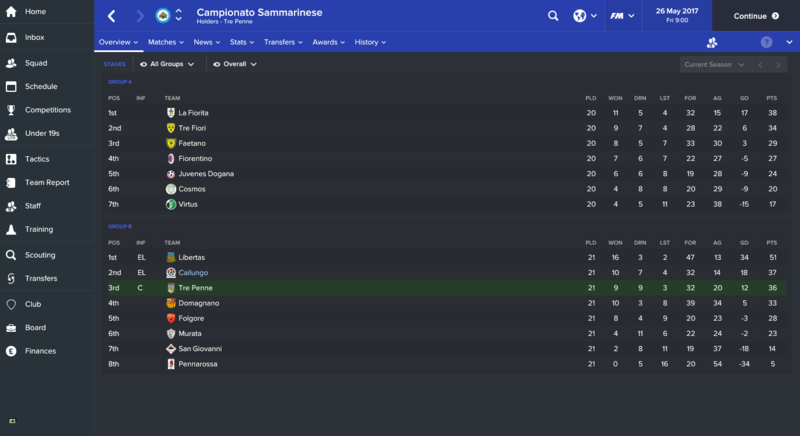 Interestingly, Sampdoria are relegated which seems surprising to me as I remember them being quite good? I'm perhaps outdated though. Italy also sees the Champions League AND Europa League return to the country but it's not with whom you might think - Napoli whipped Real Madrid 3-1 in the final to bring it home and Inter surprised everyone to defeat Manchester United 2-0 and prevent Mourinho winning a treble in his first season. The teams we can face... Not sure if we can beat any of them, but I suppose I'd be happy with the teams from Montenegro or Luxembourg. Not quite sure who Lechia are but I wouldn't fancy our chances against any Polish side. Can't see us making any waves here unfortunately. It was unexpected but I'll take it! Hopefully we can get a facilities upgrade out of it. The first youth facilities upgrade! Great start, but despite of losing to Split, facilities are up ahead! 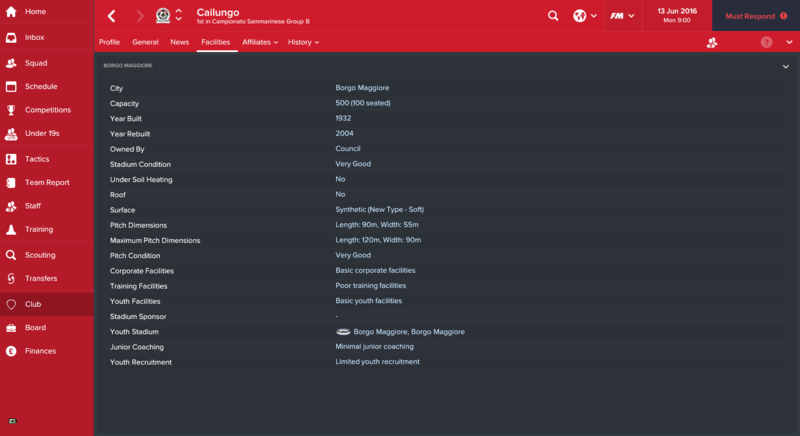 I will keep looking at Cailungo in the next season. By the way, how's San Marino in the 2018 World Cup qualifiers? Thanks! I think we were always going to lose to Split and did well to keep the score low - the money will go a long way though. As for San Marino... not great as you'd imagine. The highlight of 2017 so far is a 1-1 draw with Gibraltar in a friendly. Although they did only concede three at home to Germany and scored in the away fixture, so I guess there can be some pride taken away! Sent off on his international debut. Atta boy. More upgrades! Our finances look good so this was a no brainer. As I would expect at this stage, and possibly every stage? our intake has great potential. 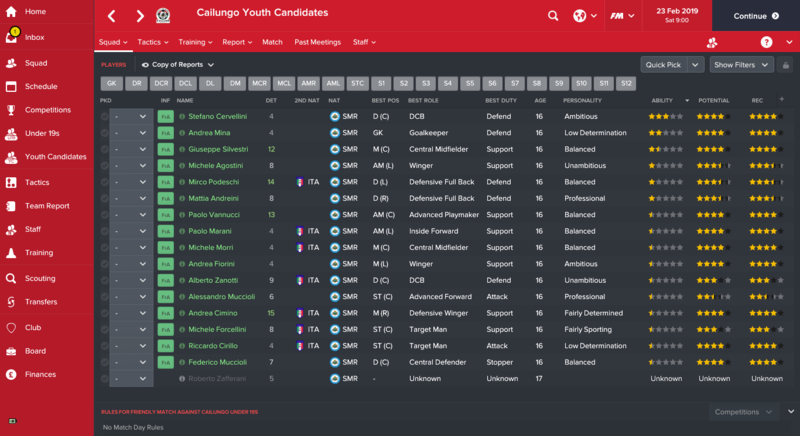 Whether these players fulfil their potential remains to be seen. One thing I have noticed instantly is a drop in the number of high determination players this year (2 with determination > 10 compared to 5 last year) and some really poor personalities. These will require work. Furthermore, one player whose best position is striker is concerning. I quite like Marton. He needs work in some areas but if we can get his determination up, I think he may be a future captain. Is also good enough to join the first team instantly. Good physicals but definitely needs work elsewhere. Determined, which is a good start. Slow though. Another who will need work. Well then. The phrase "second season syndrome" certainly crops up in my mind here as I reflect the season. 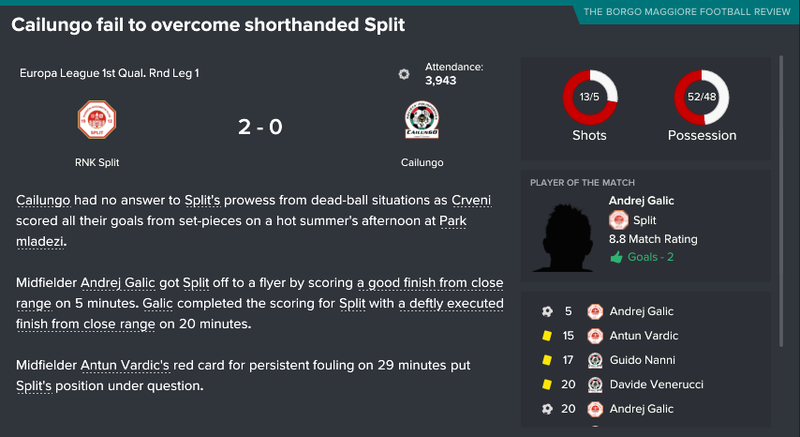 We were quite poor and inconsistent for the whole season and, despite sitting around second with two games to go, we bottled it and ended up 4th, thus missing out on the Championship playoffs. 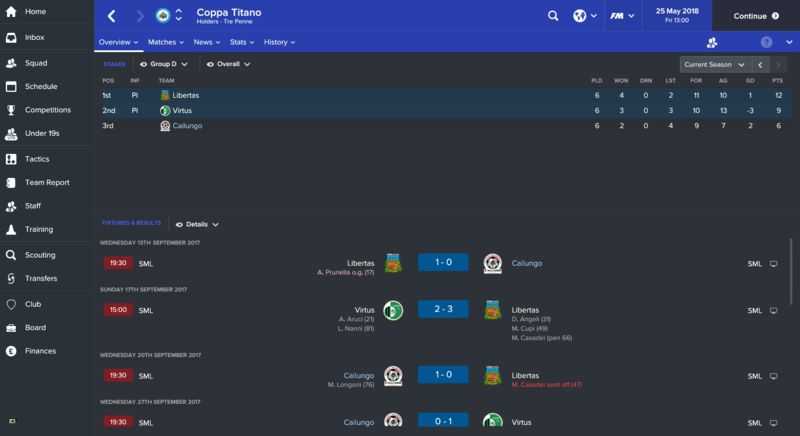 To add to that disappointment, Virtus overcame Libertas in the last game of the Coppa Titano group to leapfrog us and qualify for the finals. Disappointing doesn't even begin to cover it. 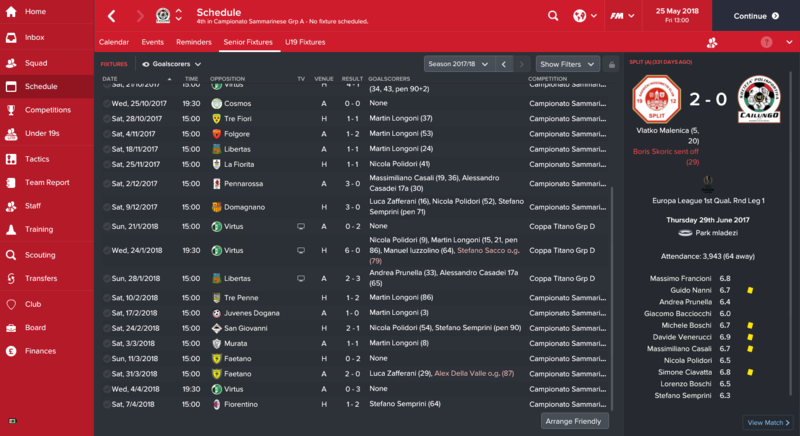 As you can see, Longoni failed to step up and fill Andrea Bartoli's boots. 11 goals is simply not good enough for a striker, but other than Longoni, we're short of options up top. His backups are a 34 year AMC converted to a striker and a 17 year old gluepot who came through in last year's intake. Until we find some quality up top, this kind of season could be our future. Guido Nanni deserves a mention for his hight average rating & the fact he picked up seven assists despite apparently having the crossing skills of a toddler. A fair effort in a poor season. 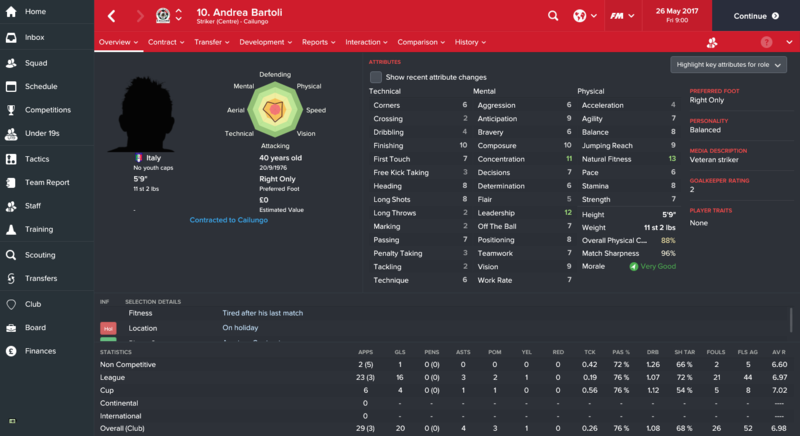 Interesting fact about Bartoli: we signed him up to b our U19's manager after he retired last year. 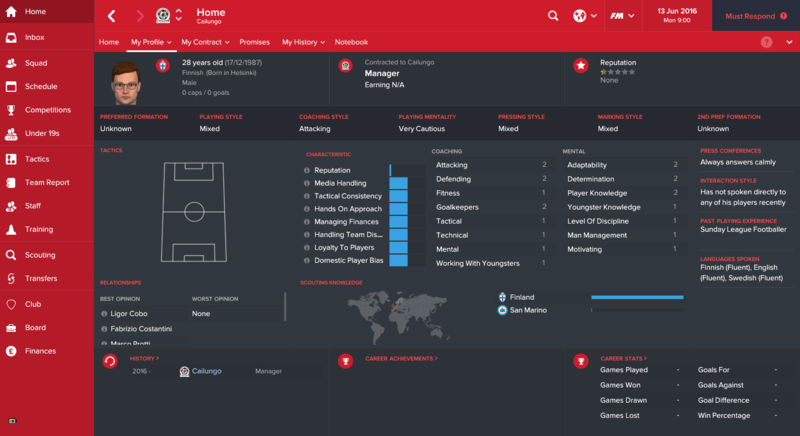 At the end of this season, he was headhunted by Pennarossa for the managerial post. One to keep an eye on for sure. Obviously, we covered ourselves losing 2-0 to Split earlier in the thread. 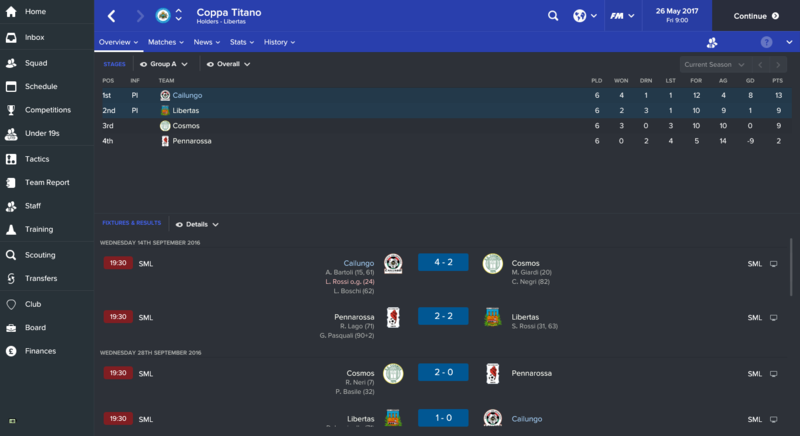 Tre Penne entered the Champions League first qualifying round and pulled off what I think is a stunning penalty victory over Malta's Birkirkara after a 2-2 aggregate draw. They met their downfall in the next round against Trencin by losing 5-0 - but that is not an embarassing scoreline against the Slovakian league champions. Great stuff. 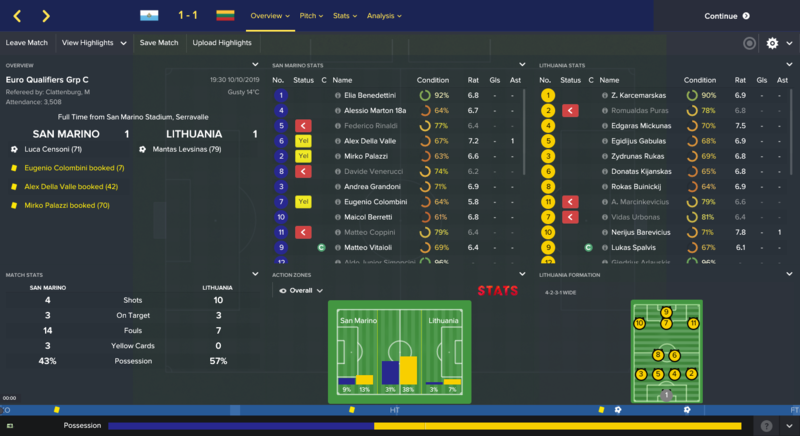 Libertas were not so fortunate and fell at the first hurdle in the Europa League, losing 3-1 to Albanian side Kukesi. In England, Pep Guardiola picked up his first Premier League title with Manchester City as they take home the trophy by three points ahead of runners up Arsenal. United finish third, perhaps suffering second season syndrome of their own, and Spurs round out the top four. Chelsea finish sixth for the second consecutive year - behind West Ham of all teams - and Jurgen Klopp is sacked as Liverpool can only finish 11th. Nuno Santo takes his job. I guess all is not all doom and gloom for Liverpool fans though - arch rivals Everton finish 18th and wave goodbye to top flight football. Astonishlingly, Merseyside Blue managed to win the FA Cup despite their league setback, kudos to them there. And Arsenal won the EFL cup for the second year running, so there is a slight consolation after their runners up medals are delivered. Meanwhile, across the pond, France throws up an interesting early curveball as Monaco take home the league title by seven clear points from PSG. 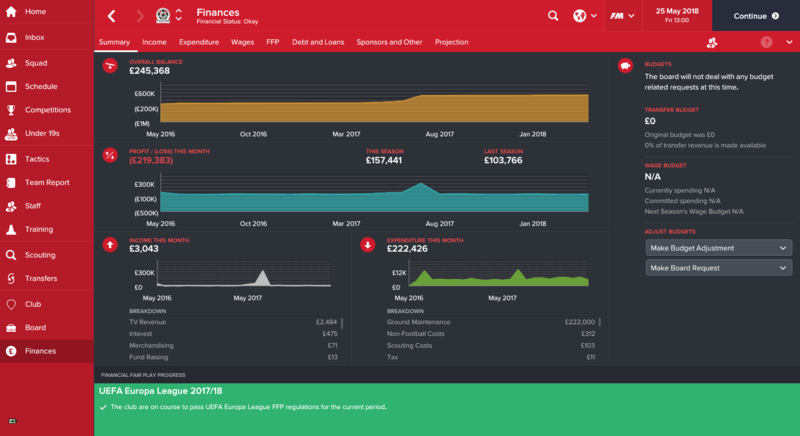 Falcao had a magnificent season and was pivotal in them winning the league. No surprises in Germany or Italy as Bayern and Juventus win their respective leagues with relevant ease. The Europa League would return to Italy but it's destination was Rome rather than Milan this year - Roma edged out Chelsea in a tight affair seperated by a late goal. PSG make up for their lacklustre league campaign with a 2-1 victory over Man City (who are definitely NOT suffering second season syndrome) in the Champions League. Must. Do. Better. Written on every player's forehead. However, I'm not actually sure if we have it in us, especially with a lack of goals. 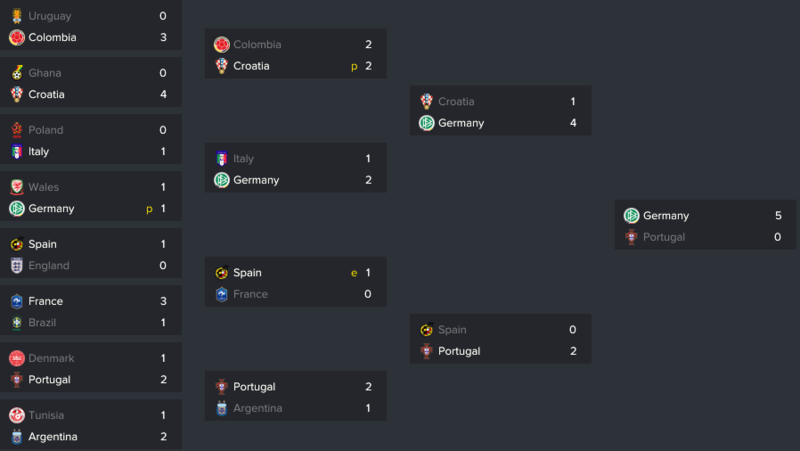 A fairly straight forward knockout group stage with perhaps only Belgium being pipped to second by Tunisia (who thrashed them 4-1) being the only major shock. Actually, you could probably throw England topping a group of death in there too. Business as usual in the knockouts really, although I for one was a tad taken back when the 5-0 scoreline appeared. Nevertheless, it's a second World Cup in a row for ze Germans. Just a couple of pieces of news; firstly, our Junior Coaching has been upgraded and is now adequate. 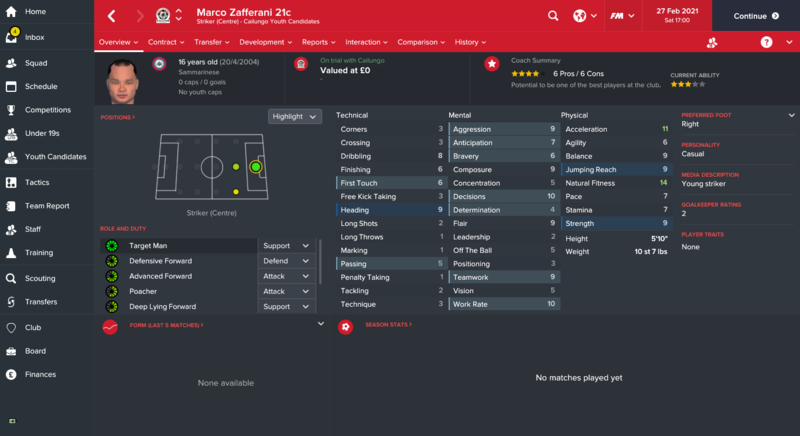 And we have our first youth player award winner! Alessandro Casadei 17a takes home Youngster of the Season after a solid debut season on the left wing, including a hat-trick. Terrific. It would seem that way, wouldn't it? Hopefully if we continue to plug away, miracles might happen! Nice start, I will be following! Not sure what to make of this intake. Our last had three central defenders as the top prospects, and we pick up another here. Although prospect is a bit harsh since he is our best defender. A GK isn't really needed as Federico Francioni 17b has that covered. A CM will come in handy though. Like the full backs too. An absolute monster of a 16 year old at 6'6, easy to see why he's our best defender. 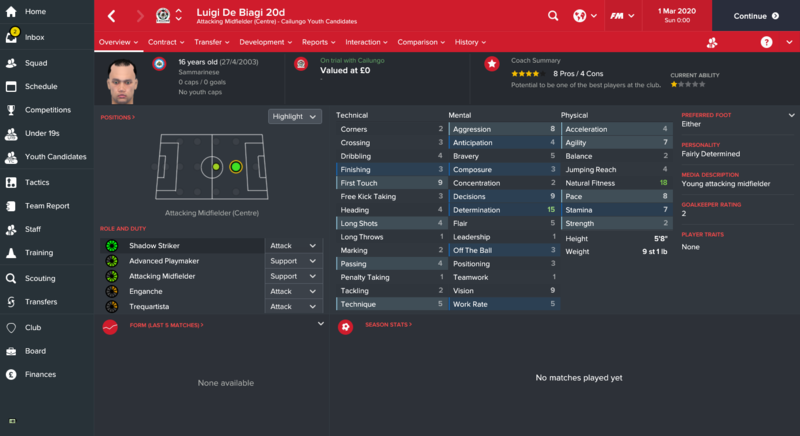 Some good attributes in key areas, particularly his technical stats. Got some good stats in with his reflexes, aerial reach and physicals but lacks in key areas elsewhere. Poor command of area and communication scare me. Looks handy. Will be useful when we inevitably lose Bartolini to a care home soon. Will have the man himself tutor him and hopefully we see a professional personality. Like his determination and his physicals. Benedettini 17f has currently made the left back spot his own but competition is welcome. I agree, looking forward to starting him next year! Got a few tall strikers as well to lump it up too. I like him. Alot. Professional personality and some good attributes. Bloody 'ell. We've only gone and done it. I know! Absolutely did not see that coming. Really not sure where to begin with this season. 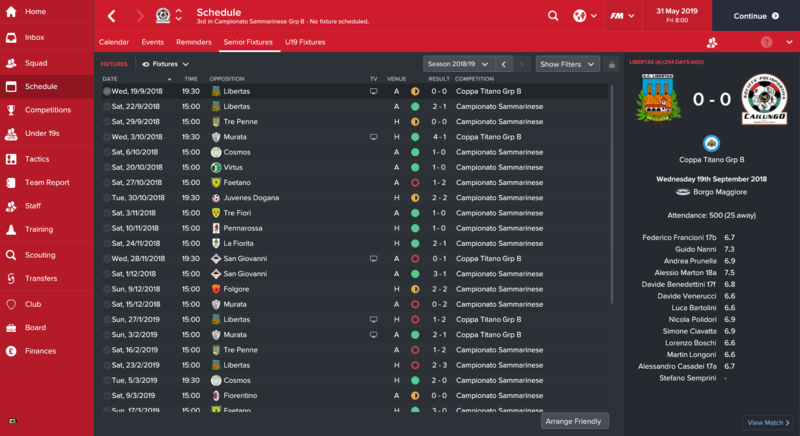 We were not outstanding by any means, shown by the fact that Libertas and Tre Penne were 9 and 8 points clear of us. But we seemed to find a 'better than the rest' spot where we perched ourselves and ended up 8 points clear of fourth. But we did the important bit and gave ourselves a fighting chance of a European place at least (our only chance since we were dumped out of the Coppa Titano.) 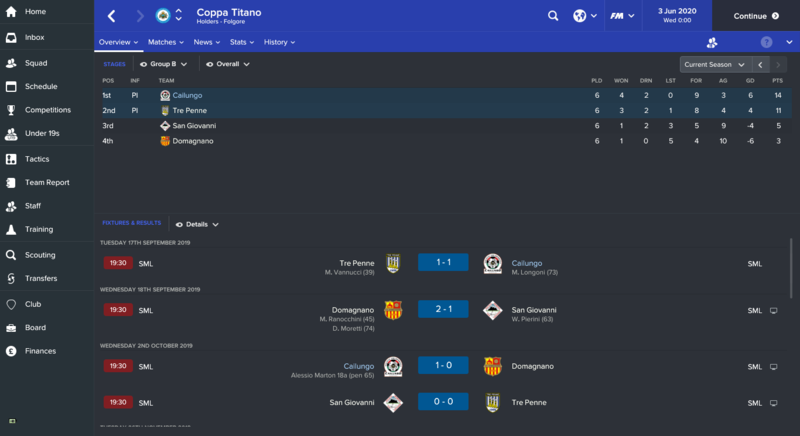 We thumped Murata 5-1 to begin with but that didn't set the tone - we tiptoed past Tre Penne first - a team we had never beaten so far in this save - thanks to two late goals from from Longoni and Alessandro Casadei 17a. Another late goal from centre back Iuzzolini saw us creep by Libertas before an extra time goal from Longoni again won us the league. One more goal from Longoni this year compared to last. 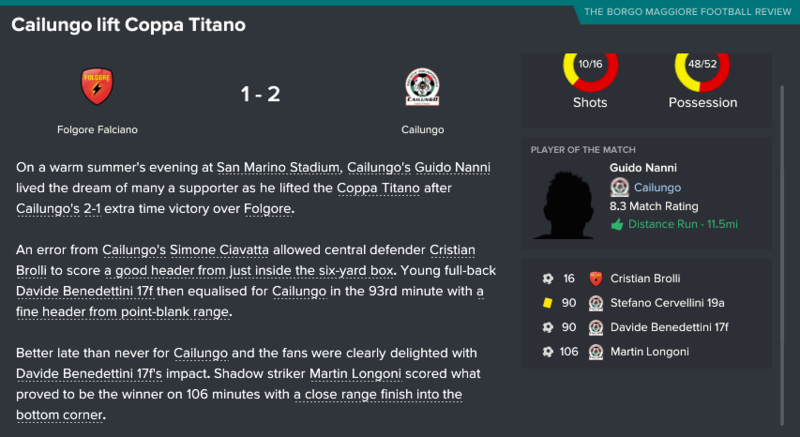 12 is still not enough in my book but he was aided by right winger Nicola Polidori grabbing ten goals for himself too. Crucially though, alot more of Longoni's goals came in key matches this year, including two in the playoff games, one of which won us the league. Still no sign of an incredible striker from the youth intake just yet but we do have a 17 year old (not the gluepot mentioned in the previous season review) who looks okayish. 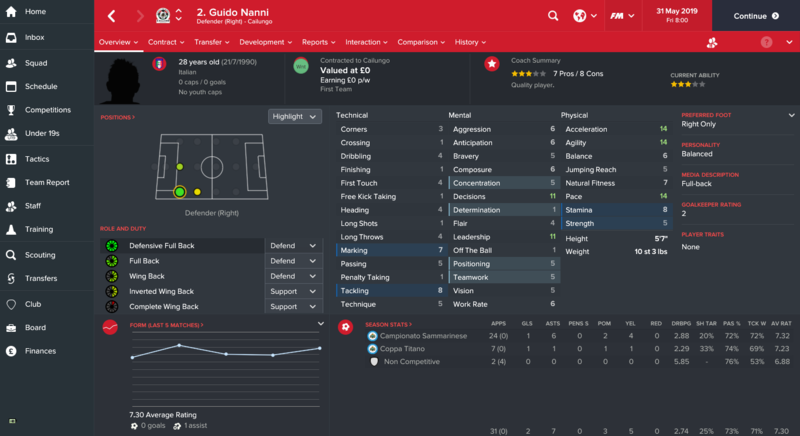 No surprise to see Guido Nanni with the highest average rating again, he has been brilliant for us at right back and constantly puts in a performance. Even chipped in with two goals this year to go with seven assists! Tre Penne defeated TNS in the first CL qualifier but lost 3-0 to Stromsgodset of Norway in the next round. An admiral performance, and we have a lot to live up to since we have stolen their spot. I don't think they've made Europe this year though I might be wrong. Libertas were beaten 6-1 by Austria Wien and San Giovanni were destroyed 10-1 by Kairat of Kazakhstan. United claim back their crown in the Premier League with 92 points, finishing ahead of rivals City by 7 points. Arsenal and Spurs complete the top four with Southampton and Leicester 5th and 6th. Liverpool finish 7th in a major improvement from last year whilst Chelsea continue their three years of disappointment with an 8th place finish. Conte GONE. Chelsea were runners up in the EFL Cup to Manchester City, who also won the FA Cup. Normal service resumed in France where PSG claimed back the Ligue 1 title, meanwhile Bayern and Juventus continued their dominance in the German and Italian leagues respectively. Milan claimed the Europa League as the trophy belongs in Italy for the third season running. Meanwhile, in the Champions League... Blimey. A rampant Ronaldo runs riot as he guides his side to victory. Same again, but better. 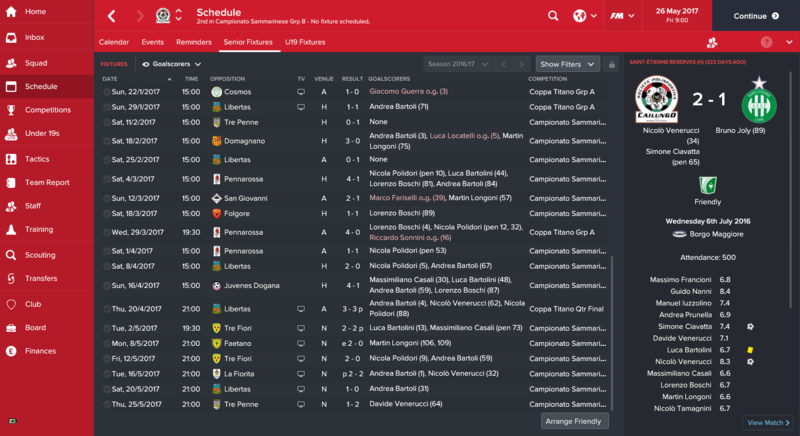 And by that, I mean top the league AND win it. I suppose I could settle for just winning it though. Our first Champions League draw. HB of the Faroe Islands - could be tricky. A good first leg. I don't know why, but our conditions were very low after a friendly a week before. Maybe it's because it's so soon after pre-season started? I don't know. Out on away goals. We really deserved more from this and I'm disappointed we didn't progress really. More silverware! We never looked in this game to be honest, but just as I began throwing everything and the kitchen sink forward, Libertas' went down to ten men. 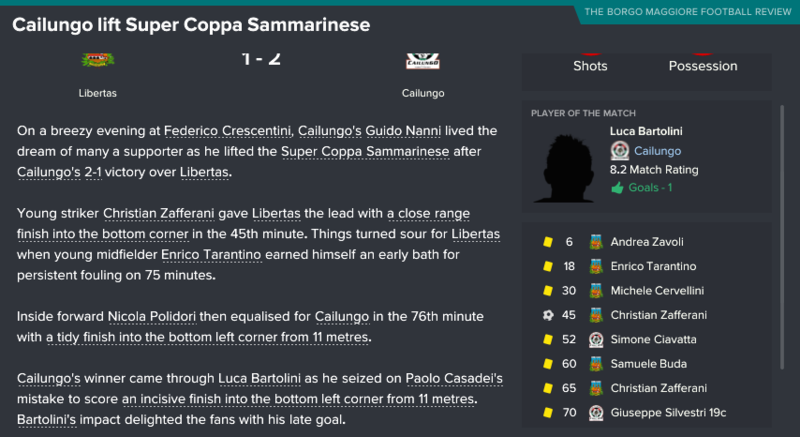 We equalised almost immediately and then veteran stalwart Luca Bartolini drilled one home in the 93rd minute. Happy days! We have a youth player in the national team! Alessio Marton 18a makes his debut and I'm sure it's no coincidence that San Marino earn their finest result since they beat Cyprus 1-0 in September 2018. San Marino's number 8 Davide Venerucci is also our player and also made his debut, although it's (rather harshly) less fondly looked upon than Marton's. Not too sure how defensive forwards work, but surely 3 for finishing is going to see any striker struggle? He's probably our best striker but I'm not going to promote him just yet. Probably strikes the best free kick in San Marino though. Has alot of work to do to claim first choice over Francioni 17b. Hell, he has work to do to claim second choice from Mina 19b. Oh wow. Deep breaths. That 20 determination is the most beautiful thing I've ever seen. Of course, inevitably it will drop but what a prize. I like him. Future left back for sure I'd wager. Either footed and high determination makes him a fairly interesting fella. I don't use AMCs currently, so I'll probably re-train him to MC. Paolo here was a bit of an after thought but those physicals are very good. Could easily displace Nicola Polidori in the future. I don't think wow even begins to cover it, but it's the best I can do. We were dreadful. And I mean completely and utterly useless in every way. The only time anyone even looked remotely like footballers was in the Coppa Titano when we topped the group table, but as usual we flopped in the knockouts at the first hurdle. Elsewhere, it was all downhill. 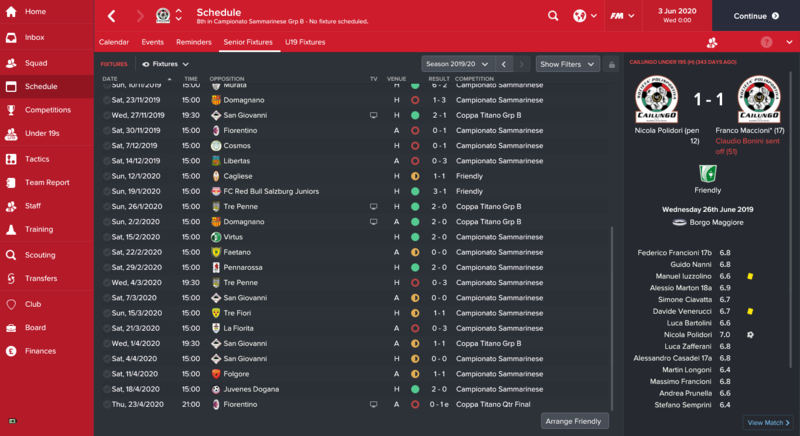 It's easily the most frustrated I've ever been in a football manager season because we lost alot of games by narrow margins that could easily have swung our way. But for the champions to finish bottom is just awful. I think the only saving grace is that we weren't predicted to do well this year despite our heroics last year. No excuse though. Not even Guido Nanni could save our season, despite the solid average rating he suffered as well and dropped to creating only two goals. Longoni got worse; he was dropped after the Christmas break for Franco Maccioni* who grabbed 7 goals but I don't think he's a long term solution either. Hopefully Enrico Caraccioli 20a can bring some goals next year because we are desperately in need of them. 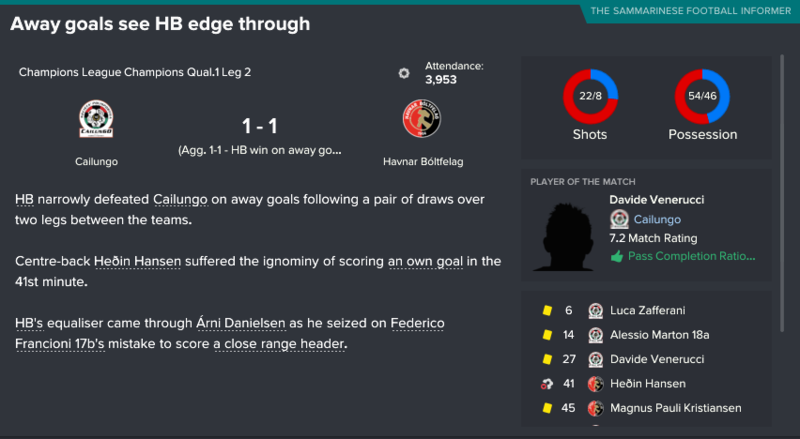 We lost on away goals to HB of the Faroe Islands, a memory I didn't want to remember but given the way the rest of the season went, this was probably our peak. Libertas lost 8-0 to Inter Zapresic in the Europa League first round. Foglore didn't fair much better, losing 6-0 against Milsimi of Moldova. United win the league again ahead of Arsenal and Spurs in second and third although there was only three points seperating them so it was a close fought battle. City were fourth and Chelsea (under new boss Zinedine Zidane) made improvements on the past three seasons by finishing fifth. Again, Leicester and Southampton finished in the Europa League spots. Liverpool, incredibly, finished 13th. Perhaps this was due to their Europa League run where they made it to the final and won the competition, thus qualifying them for next season's Champions League. 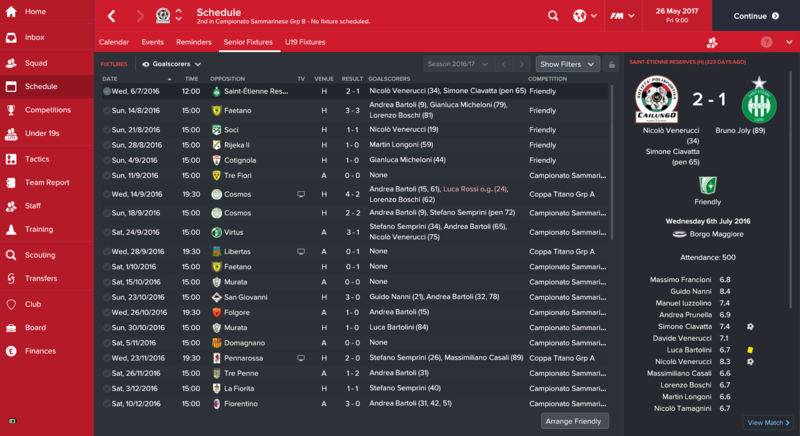 Despite this win, Nuno Santo received the sack a day later and they have since hired Ricardo La Volpe. Nope, I had never heard of him either. United also won the FA Cup and the EFL Cup to bring home a domestic treble. Well done, José. 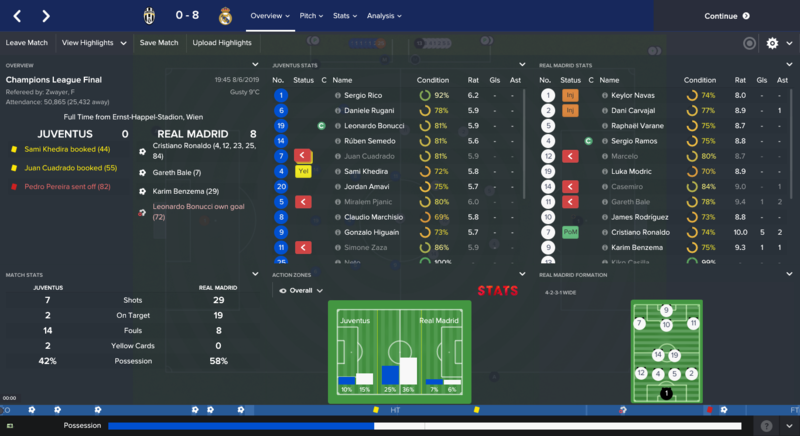 However, the Special One was denied what would have been an incredible quadruple when they lost the Champions League final to arch rivals City. Ouch. In Germany, Bayern ran riot as you'd expect. In France, it was much, much closer and Monaco pushed PSG right to the final day but had to settle for second in the end by two points. Juventus won Serie A by some distance to complete a trio of expected results. Can be chalked down as the only progress we made this season. 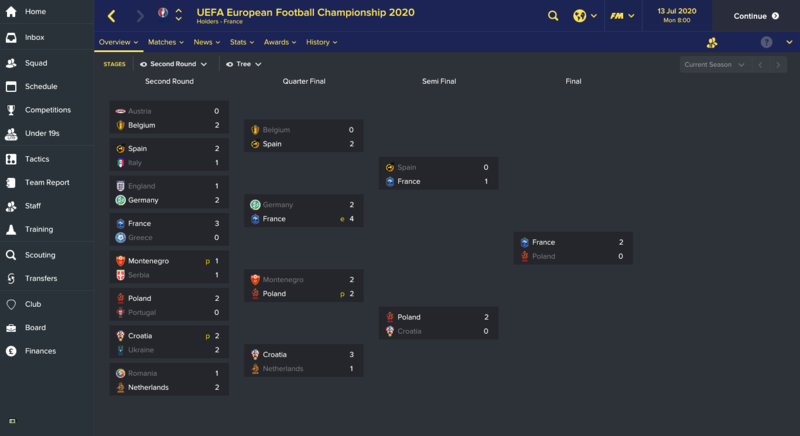 France claim the Euro 2020 title by defeating Poland in the final. 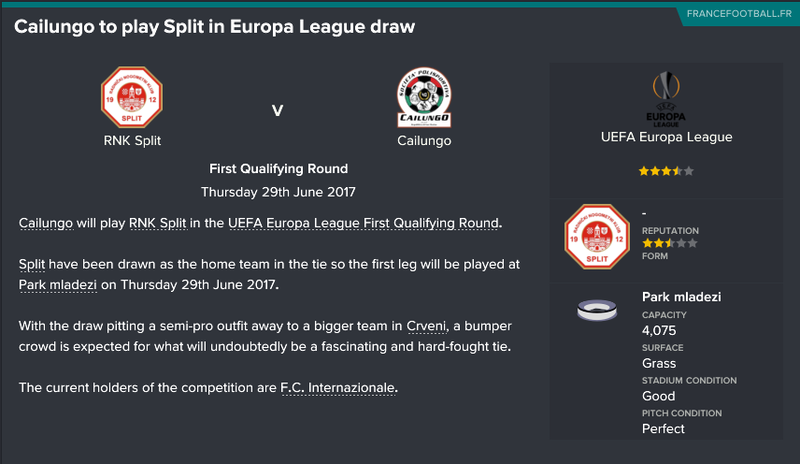 It may be a shock to see Poland in the final but just look at how tough that top half of the draw was compared to the bottom. 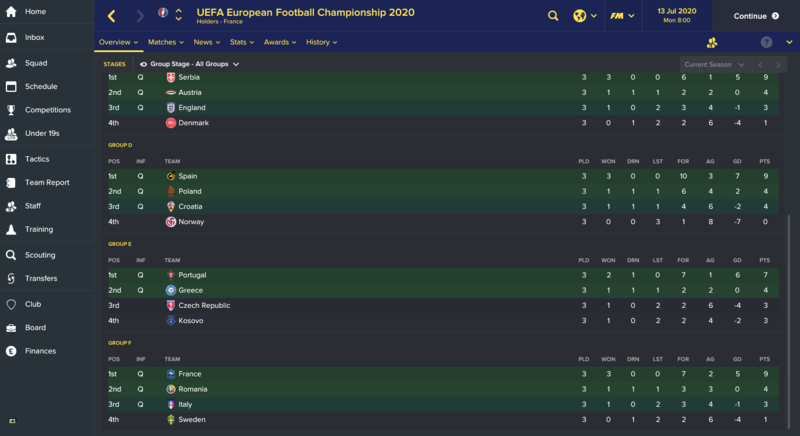 Huge props to both Montenegro on how far they progressed in their first tournament and to Kosovo for qualifying which was a great sight to see. Poor old England struggle though. Now, that's going to make things bigger for Kosovo and Montenegro! For Montenegro and Kosovo, what's their ranking after the championship? Did San Marino won a single point in the Euro 2020 qualifiers? Montenegro sit 55th in the world rankings while Kosovo sit 41st. Kosovo seem to be a handy looking side! San Marino picked up one point in the qualifiers after a 1-1 draw with Lithuania which is pictured a few posts up. What we have here is probably one of the finest players San Marino has ever produced. That passing stat. Those physicals. I can see us struggling to keep him. What a player! Good finishing and dribbling, like the look of him alot. Probably our best striker. Fairly pacy for a man whose favourite role is target man but at 5'10 he's probably not a target man. Not bad at all. The class of 21 has been very kind to us. Rondelli looks a cut above, national team beckons for him straight away surely. We are cup winners! In the most dramatic fashion as well, unlikely hero Benedettini 17f, a left back, ghosted in at the back post in the 93rd minute having come on in the 82nd minute. 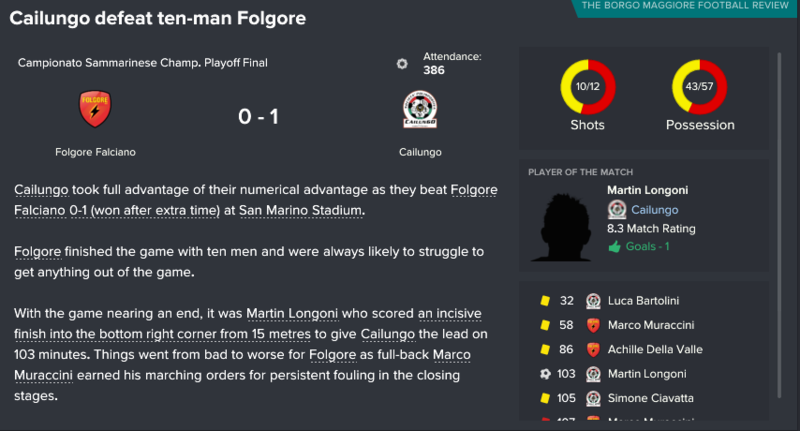 Then Martin Longoni, who lost his striker spot in the starting 11 this year, fired home the winner with only his second goal of the season. Scenes! 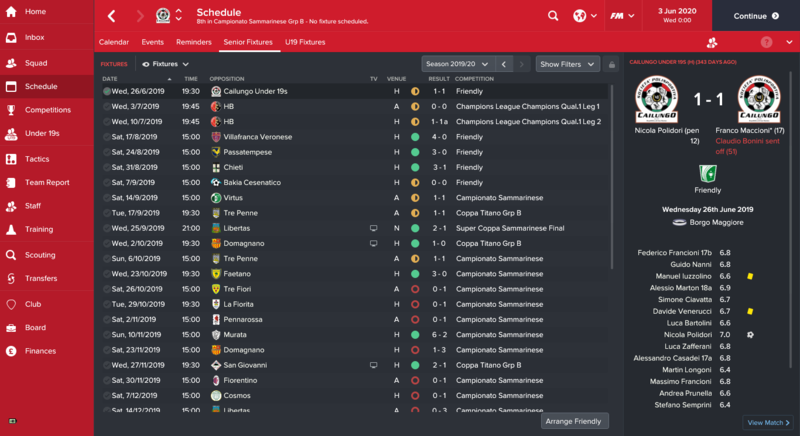 Despite firing blanks in the league we have qualified for Europe! I think at least.